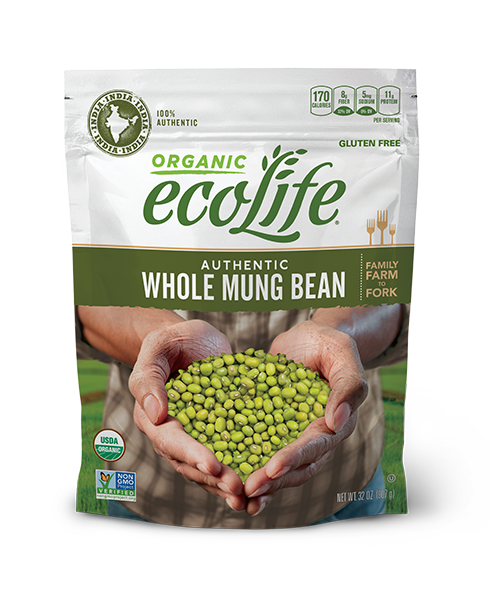 ecoLife® Organic Whole Mung Beans are small, cylindrical beans authentically sourced from India, that are a great source of complex carbohydrates, fiber and protein. These versatile beans are delicious in dal, a traditional South Indian dish, with or without vegetables. Sprouted or soaked Whole Mung Beans area good component of any healthy meal. Sort, rinse and drain before cooking. For added flavor, add a pinch of salt or other herbs and spices before cooking (optional). To decrease cook time, soak for 1 hour and reduce simmer time by half. Combine 1 cup Whole Mung Beans and 3 cups water in a saucepan. Bring to a boil. REDUCE HEAT (medium-low to medium), cover and cook for 60-70 minutes. Add more water, if necessary, to keep the Whole Mung Beans submerged. When done, Whole Mung Beans should be tender and soft. Combine 1 cup Whole Mung Beans and 3 cups water. Never fill cooker more than half full. Bring to pressure on high heat. Reduce heat to low but keep under full pressure and cook for 15-20 minutes.